Early in 2012, former Prime Minister Naoto Kan said, "Japan needs to dramatically reduce its dependence on nuclear power, which supplied 30% of its electricity before the crisis." In late February 2012, a new report by the Rebuild Japan Initiative Foundation found that during the nuclear disaster, no one knew the extent of the damage at the plant. The report also said that while leaders downplayed the risks to the public, they secretly considered evacuating Tokyo. March 11, 2012, marked the first anniversary of the earthquake and tsunami that killed almost 16,000 people and set off a nuclear disaster in Japan. A year later, the country was still recovering. While the country rebuilt factories and roads as well as showed growth in its economy by the end of 2011, the cleanup was still far from complete. At the one year mark more than 160,000 people had not returned to their homes in the radiation-poisoned areas. Not trusting the decontamination process, they refused to go home even after the government lifted evacuation orders from certain communities. In Late March 2012, the operator of the Fukushima Daiichi Nuclear Power Plant released the results of an internal investigation that contradicted previous reports and raised concerns over the plant's stability. The latest investigation found that the water level at the core of one of the reactors was far lower than previously reported. Meaning, the fuel rods may not be covered in water and could heat up again. The investigation also revealed that radiation levels are currently 72.0 Sieverts inside the reactor's containment vessel, strong enough to kill a person within minutes. The high level of radiation could also cause a malfunction in electrical equipment. One of the best things about Japanese manga is the characters. From the heroes and heroines to their sidekicks and enemies, every character in a manga has his or her own personality. The manga artists' detailed depictions of the characters draw readers deep into the stories. Let's meet some characters from two manga that are popular with Japanese kids right now. The first manga is Gin Tama. In this story, aliens suddenly arrive in Japan during the Edo period (1603-1868), when samurai warriors were still active and the city of Tokyo was called Edo. A long battle begins between the people and the aliens, but the aliens are so strong that the leaders of Edo have to accept their demands. The aliens walk around Edo, looking down on the people. Meanwhile, the samurai who fought against them have to give up their swords, and many of them lose the will to live . . . 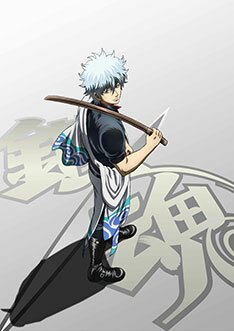 The hero of this story is Sakata Gintoki, who keeps his samurai courage alive amid the despair. 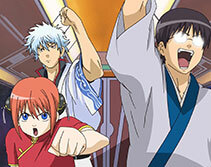 Gintoki runs an odd-job shop, where people come to ask him to solve all kinds of problems. He has a habit of prying into any sort of trouble that happens in Edo. Although he's generally lazy and is always cursing, what Gintoki values above anything else is giri-ninjo, or the spirit of keeping promises and being compassionate. He lends a hand whenever he sees someone in trouble and sometimes has to fight to help people out. Gin Tama is a fun, joke-packed manga that is a big hit with Japanese kids, who think Gintoki is cool for being so kind. Among the other colorful characters are a girl called Kagura, who loves eating and is amazingly strong, and Shimura Shinpachi, the son and heir of a sword-fighting master. 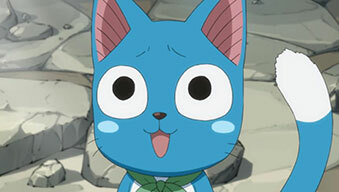 Another of many unique manga characters is Lucy, the heroine of the Fairy Tail series. Lucy is a young girl who is determined to become a great wizard. 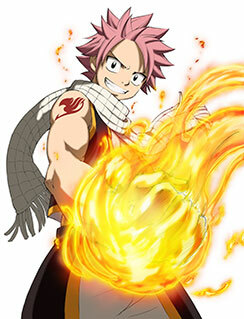 One day, she meets a wizard called Natsu, whose special skill is using fire. 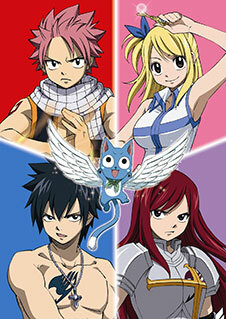 Natsu invites Lucy to join Fairy Tail, the guild of wizards to which he belongs. (A guild is a group that finds jobs for wizards, and anyone who wants to be a great wizard has to join one.) Fairy Tail is not like other guilds, though, because each of its members is an unusual, one-of-a-kind wizard. What makes Fairy Tail special is that all the wizards accept each other for who they are, including their strengths, weaknesses, and secrets from their past. They trust each other and are always ready to help each other, even if it means making a personal sacrifice. A lot of kids see parallels with their own lives as they read about Lucy and the other wizards growing up together as close friends. What these two manga have in common is the appealing way that both the main characters and their enemies are portrayed. Even after a battle is over, the villains remain in the story as important characters, which means that the worlds depicted in these manga keep getting wider and wider. 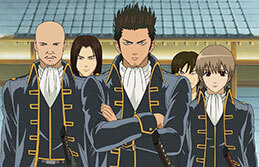 This is also one of the reasons why these works have become long-running series and have been turned into successful TV anime. The follow is selection of activities that are not done in public in Japan. Although these behaviors are seen as being rude by Japanese standards you, as a foreigner, should not worry too much about adhering to them as it is not expected of you. 1) It is considered a shameful act to kiss in public. 2) Hugging is considered impolite in Japan, as is any other sort of physical contact. 3) Chewing gum: doing this in front of someone is not excepted, but smoking in front of someone is. It is also considered rude to be the only person eating something. 4) One should always take off their shoes when entering a Japanese house or restaurant (you will most often be supplied with slippers). This is one that foreigners should observe. 5) Of all of the above this may seem the strangest to foreigners: It is considered rude to look into the kitchen of a house that one is visiting. 6) This may be the most pleasant to foreigners (especially Americans): Civil court proceedings are avoided as Japanese emphasize relationships based on trust rather than contracts. Therefore most problems of a civil nature are discussed through third party mediation. The only time one goes to court is when there is no hope of maintaining a relationship between two parties. It is interesting to note that the number of lawyers in Japan is one-fiftieth of that in America.